Grawk called and said it wants to be a Multnomah Shawl. Ahh yes, my lovely Grawk. I am more than happy to grant your wish. Grawk is one of the Raven Series from Tina at Blue Moon. It started its life out being Raspberry and Pond Scum. Then one day the darkness took over and it was overdyed with black. But the Pond Scum and the Raspberry still peek through, just enough to for you to recognize them. Details on my Ravelry page where I am known as knitterati. Basically, this took about a skein and a half and I went WAY up in needle size. 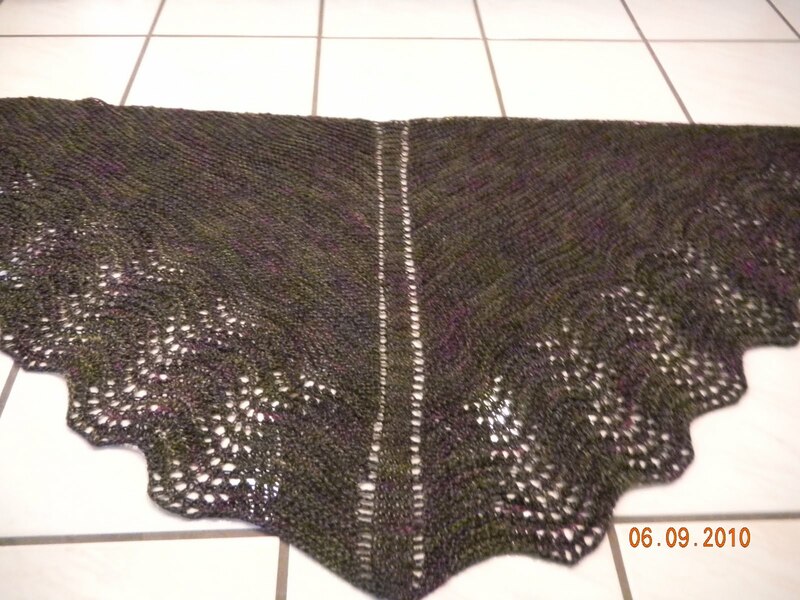 The pattern is written for a size 3 and I bumped it up to a 5, swatched by actually starting the shawl, then bumped up again to a size 7. Instant gratification and a fast knit!